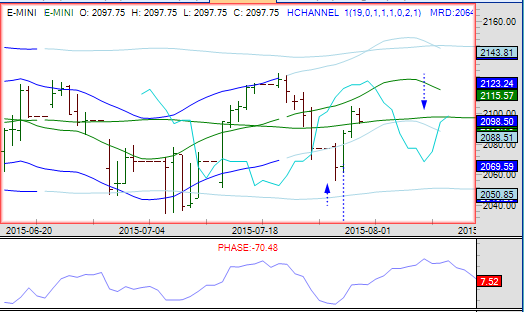 This entry was posted in Analysis US Markets and tagged 71-year-cycle DJIA NASDAQ on July 23, 2015 by Ray Tomes. This is a comparison that I did some years ago. David asked about Kondratieff cycle now. 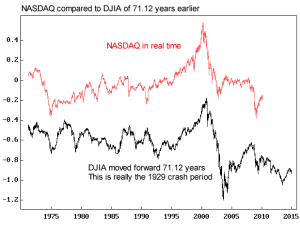 I think the correct cycles to look at for stock market are 71 year, 35.5 year etc. This shows why. But note that at other points (than the big peak), other cycles will not all be at the same phase whereas at that one point these cycles all coming together dominates things. These cycles almost exactly match Hurst’s nominal model: 17.78, 8.89, 4.445, and the 0.741 matches Hurst’s 40-week cycle, and the 1.482 matches the 18-month cycle. Interesting also to see the 5.93 cycle – I have been wondering about a 6-year “harmonic echo” for some time. I have wondering for years why you are so stubborn about the 6 years cycle David. ! there is no no “echo” but a cycle . this cycle was discussed at lengths by Dewey and researchers of the FSC. is it so difficult to accept a second series of cycles 4,5 months, 9 months, 18 months, 3 years , 6 years etc ? Those are excellent articles which I thoroughly enjoyed reading. 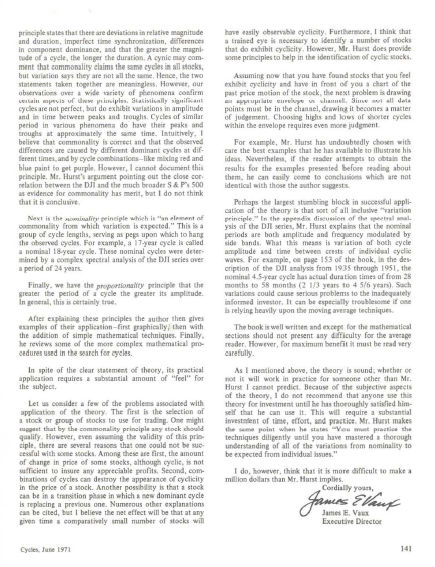 I think both authors make the case that Hurst’s methods from the mathematical viewpoint are much more complex than the simplified, synchronized trough method that is most often put forth as the Hurst method. 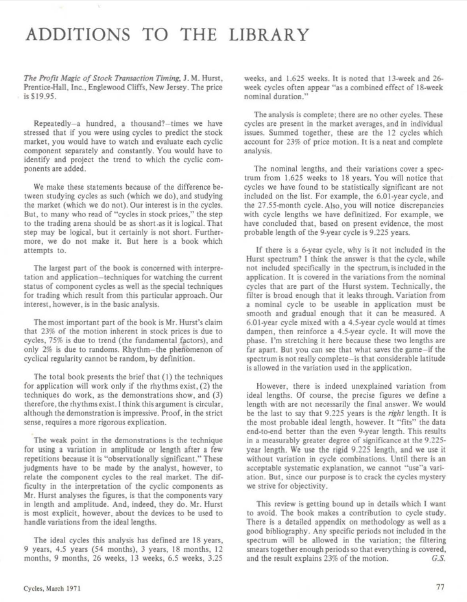 I have in PDF format all exemplaries of the Cycles review. They are at the disposal of those interested. You could see the filiation between the works and results of the researchers of the FSC and what Hurst has written (vulgarised ???). For me Hurst is not an icon. His “model” is just an “Initial Cyclic Model” good enough for a first cyclic reading of a financial instrument. 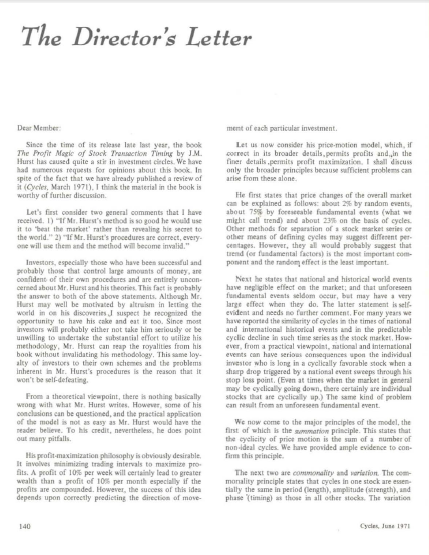 His cyclic “principles” were long ago defined by the various researchers of the FSC. Note that in his book and course Hurst never made the slightest reference to these works and these people. Why ? Note also that After 1975 Hurst has disappeared . Why? What was his life after this period ? Curious at least. Where are you? Its been 5-6 weeks since any update on the market which seems fairly lengthy. Just wondering what your take on what’s been going on over the last month and if we are expecting more downside? Hope you and your family are okay and doing well. nice to see you here on board Ray ! by the way David it would be useful to have a new feature allowing to compare 2 instruments and even to calculate a percentage of correlation / commonality. Which allows also to create “groups” having the same behaviour. this will allow us to create “groups” of shares. 10 to 15 % of the components of each index has made a “6 year” low in october / november 2002 and october / november 2008. Yes, common cycles is important. When Dewey put common period cycles from different series together he found a great degree of common phase which he called “Cycle Synchrony”. I want to build up a catalog of such phases for all cycles periods as a starter. Then the phase of related cycles can be compared as Hurst and others have noted. Finally, I want to look at why cycles vary in phase and amplitude. If that one can be solved then predictions can be so much more accurate and trading that much more profitable. Using some of these techniques I was able to predict at FSC (Foundation for the Study of Cycles) conference (in late 1994 from memory) that we were at the trough of DJIA then and that the next cycles would be a slower one. Other speakers also identified it as the trough but no-one else had picked the slower cycle coming. With all my respect . Changes in the amplitude and the cycle phase could there be any other answer besides the superposition principle? Well, I think this can be solved with cycle superposition principal. “commonality” is a vast subject and cycles troughs are not the only components. which ones and how ?